Eyetracking and Heatplots and Ads, Oh My! And this ad is a great example of having the Headline, Picture, and Body Text work together non-redundently. By that I mean all the pieces fit together, but your “need to know” is provoked by both the picture and headline, forcing you to read the body text to satisfy your curiosity. 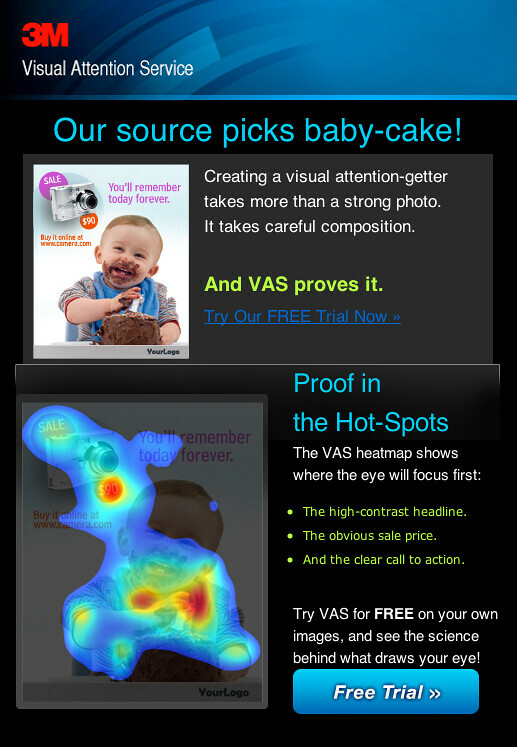 This next page showcases the superior visual attention-getting properties of the high-color ad featuring the cake pictures — at least according to 3M’s proprietary Visual Attention Service heatmaps. Unfortunately, though, the page doesn’t show us the heatmaps from BOTH ads so we can see for ourselves – we only get shown the winning ad and have to take 3M’s word for the results. So that’s something of a fail. And then there are the factors I mentioned before: that the use of visually prominent colors in the alternate ad “biased” the results away from what most people would have assumed was the more attention-grabbing ad. 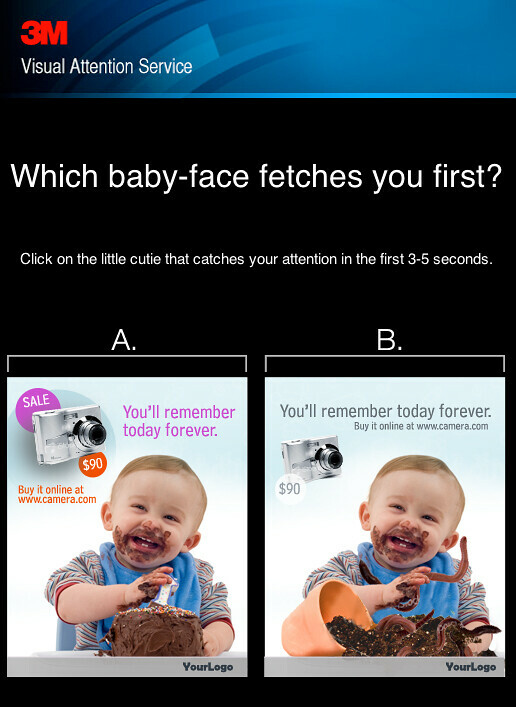 And how do I know that the baby-with-worm picture is really the more attention-grabbing photo? Because that’s the picture 3M chose to use for their own (real) Facebook ad! So what are the takeaways from this? Pictures with faces, “Story Appeal,” and/or “Alarm Triggers” are equally attention-grabbing, even if they are not as visually prominent. This is because they work on an emotional, rather than purely perceptive level. When you see the baby face, your eye is drawn to it, because we are hard-wired to pay attention to faces and babies. And when you see the baby holding a worm, alarm and curiosity further peak your emotional response. In other words, the picture both draws your eye and your sustained attention, causing you to actually read the ad. A red label might get me to “see” your ad, but it hardly guarantees that I’ll read it. 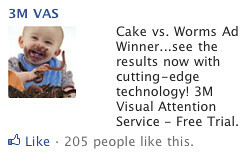 But a great picture like the baby with worms usually WILL get me to read the ad. See the difference? So why not use both techniques? Good question: why wouldn’t you? At the very least, it would be worth testing, don’t you think?